Discussion in 'UFC Discussion' started by Legendary, Apr 16, 2019. Dana obviously had a hard on for him since the beginning. Just like Conor, they gave him favorable match-ups since the beginning against guys who didn't have that great of wrestling. I just find it weird how he didn't have to fight Weidman, Jacare, Romero, or even Paulo Costa and he has an interim belt. Great fighter, but jeez they are really pushing this guy. Want to see him against one of those guys to see if he truly is elite. muaytao, Harlekin, reciprocate and 16 others like this. Yeah as much as i love Izzy, he did kinda shoot up the rankings way too quick for my liking. At least he actually got the interim belt in the end though, if he lost the fight that would have complicated things. I am curious though how a jacare, weidman, romero, costa fight would go. JunkieJoe, octopus, Anaconda99 and 1 other person like this. I say match him up with Romero. The winner of that fight is more than deserving of a title shot. thehighking, Knuckledragger, Harlekin and 7 others like this. Before the fight he was going to have his hype train derailed by Kelvin, and now it's "he hasn't fought ___"
RNC88, JunkieJoe, thehighking and 18 others like this. Nah, I remember people favoring Vettori, Tavares, Brunson and Gastelum over Israel. Now, you're rewriting the story. RNC88, jemstar, Psychedelic and 14 others like this. Because it screws guys like Tony out of title shots. I just want to see if he is for real and I think one of those guys will really push him. horc00, Silent Liker and Anaconda99 like this. Lmao so now the guys he beat were not good enough for him? Wtf and he fought those guys you listed you would have said he didnt deserve them. Wtf is up with these haters. You wanted him to fight all those guys? He has 6 fights in ufc. Knuckledragger, Hotora86 and Iroh like this. Who? He was the favorite in every single UFC fight he has had besides Tavares which was split. EdmundsEmptyBankAccount, Harlekin, Dana's Moonface and 5 others like this. What part of those were easy style matchups? Mcgregor getting a easy style matchup his whole career is a false narrative. 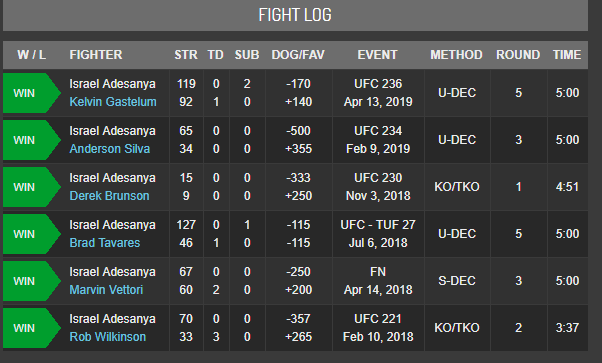 Anyway Adesanya is fresh blood in a division that has been dominated by the same guys, it’s fun to have something new in there even though I feel Jacare deserves the TS more. Psychedelic, Iroh, KootenayKid and 5 others like this. Newsflash. He'll get wrecked the first time he fights one of the true elite MW's. Kenny Powerth, Doughie99, Andreh and 3 others like this. Hotora86 and Andreh like this. Hotora86, KootenayKid, Isthat-yo bop and 3 others like this. I can easily just make the argument that I remember people saying Israel was going to win all of those fights too. The reality is that apart from this Gastelum fight which was insane, he got pretty favorable match ups. Might not of seemed like it at the time, but its pretty obvious. Most of those guys are aging and probably In the twilight of their career. It makes no logical sense matching up against opponents who might win, take some of that hype while also not being In a position where they'll be around much longer. Not hard to see why they'd want the future to carry the torch of the division. Currenly, that's Whittaker, Israel and Gastelum. I mean. They did it perfectly really. That's how you build up a fighter. Wouldn't have made much sense to match him up against Jacare or Yoel earlier In his career. Put a fighter In a position where he'll attain his full potential Is the play. It's certainly true that Israel has had a favorable path to the title. But it's also true that he fought a legit wrestler (Brunson) before receiving a title shot, whereas Conor didn't fight a single wrestler before getting a title shot. Dana obviously had a hard on for him since the beginning. Just like Conor, they gave him favorable match-ups since the beginning against guys who didn't have the great of wrestling. I just find it weird how he didn't have to fight Weidman, Jacare, Romero, or even Paulo Costa and he has an interim belt. Can't really disagree with all that ^^^ although I do think Israel looks to be a more versatile fighter than Conor and looks far more willing to defend a belt I feel more secure into backing Israel than I ever did McGregor who also got a red carpet ride to a belt and never officially backed up his belt with a title defense, one can consider the Khabib fight was his 1st unofficial title defense and we can see why now no title defense. Emporio Alnino, 91 seconds, WhosTheBoss and 3 others like this. So you're saying that Conor's nightmare matchup is anyone who has good striking, wrestling, or cardio? You do realize how crazy you sound, right? And no one is going to take you seriously when you have another man as your av.